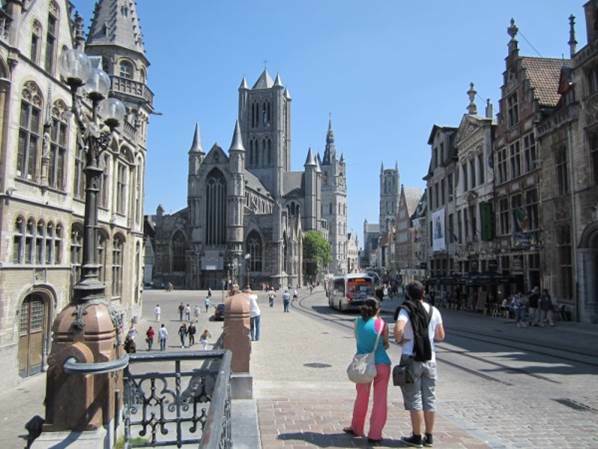 In 1996, Ghent created a car free city centre in order to tackle several problems including: persistent traffic congestion, poor pedestrian and cyclist safety, energy and air quality. The car free zone has contributed to improving Ghent’s city centre environment by introducing better public transport, stimulating regeneration of the city centre, dramatically improving the attractiveness of Ghent as a major shopping and tourism destination. Major benefits include a reduction in transport energy use and a more liveable city for the citizens of Ghent. Comfort: including repair points for bikes, safe storage, bike hire and route planners. Political leadership with a long term approach - in 1996, when the car free zone was created, there was no policy for air quality. A political process resulted in the car free city centre, as part of a long term approach to improve Ghent socially, economically and environmentally and over time, a Local Policy for Air Quality (2005-2010) was established, in which the city of Ghent stipulated a plan to increase urban air quality and stimulate a liveable, healthy environment using a set of local measures; this was Ghent’s first policy for air quality. Collaboration and dialogue with all stakeholders - the creation of additional initiatives alongside the car free city centre, such as bike hire and park and ride routes, has made the scheme more attractive to residents and visitors, and made it easier to engage with different stakeholders. Contribution to multiple policy objectives - The creation of additional initiatives alongside the car free city centre, such as bike hire and park and ride routes, has made the scheme more attractive to residents and visitors, and made it easier to engage with different stakeholders. To read a full report on Ghent - Car Free Centre and why it is a good example of a Lighthouse initiative click here. More information on Ghent is available here.